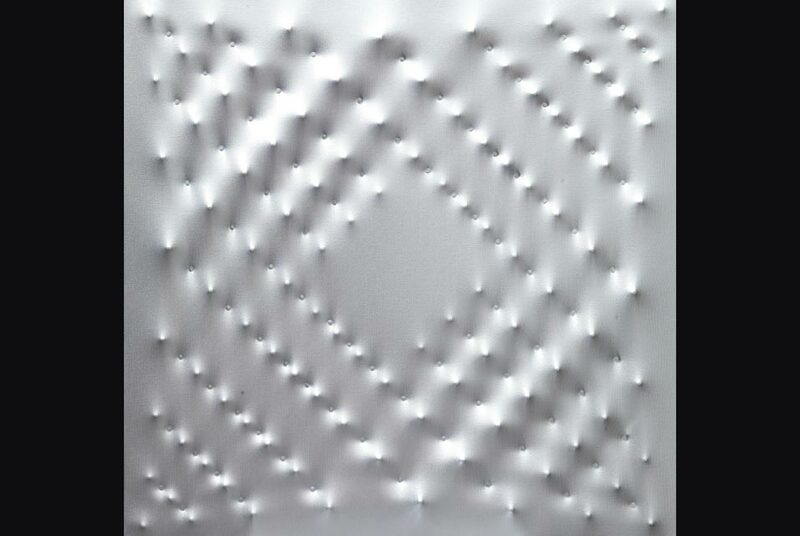 Enrico Castellani, Surface argent, 2005, acrylique sur toile, 80x80cm, courtesy galerie Tornabuoni Art. PARIS.- From 14 October to 17 December 2011, the Tornabuoni Art Gallery will show a masterful retrospective devoted to Enrico Castellani through some 45 works of art. Known for his monochromatic embossed canvasses, Castellani (born in 1930) is a major Italian figure associated with the ZERO movement who, by rejuvenating the language of image and form, greatly contributed to the development of avant-garde artists in Europe in the 1950s and 1960s. After distancing himself from the expressiveness of pictorial portrayal, Enrico Castellani proceeded to produce monochromatic pieces rendered dynamic by the action of disturbing elements: nails. Indeed, behind a canvas stretched over a wood frame, Castellani places nails that raise or lower the canvas and so create an interplay of light and shadow. The Italian Experimentation room opens with one of his works in the new contemporary collections area of the Pompidou Centre (level 4). In addition to this public recognition, Enrico Castellani also attracts collectors: his highly sought-after works sometimes go for as much as one million dollars on the auction block. In 1959 Castellani made his first embossed surface, his first "extra-flexed" monochrome, which would be followed by multiple variations in the distribution of the various components. In so doing, he inaugurated his own personal poetics with the technique of "differing repetition", by carefully choosing the placement of the recesses and reliefs that give rhythm to his canvasses. This autumn, the Tornabuoni Art gallery will present a historical work: a Red Diptych from 1963. His original approach is considered fundamental for the art history of the 20th century, not only in Italy, but also on the international scene; In particular, Castellani influenced Donald Judd, who saw him as the father of minimalism. For the occasion of this Castellani exhibition, which is his first major retrospective in a gallery, Tornabuoni Art is publishing a very complete catalogue on the artist with a preface by Bernard Blistène. And from 20 to 23 October, Tornabuoni Art will participate in the FIAC with a selection of crucial artists for the international art market. The Tornabuoni Art gallery inaugurated its space on Avenue Matignon in Paris on 1 October 2009 with an exhibition of Lucio Fontana, which was met with keen interest, followed by a retrospective on Alighiero Boetti in the spring of 2010. More than 4,000 visitors turned out. The Paris exhibitions are handled by Michele Casamonti and Gaïa Donzet in collaboration with Tornabuoni Arte in Florence, which was the first gallery created in 1981 by Roberto Casamonti in the street that is its namesake. Since then, Tornabuoni Art has opened galleries in Milan in 1995, Portofino in 2001, Forte Dei Marmi in 2004, and lastly Paris in 2009 to be closer to its clients and optimally meet the expectations of its audience of international collectors. Alongside his modern art activities, in 2006 Roberto Casamonti opened an antique gallery including furniture, paintings, sculptures, and gold pieces from the 14th and 15th centuries, his other passion: ''l'Arte non ha tempo'' (Art is timeless).